Great News! We have recently completely renovated our bathrooms and added better WiFi for your enjoyment! Stay for $100 per day per guest or less! Add an all inclusive option for just $40 per day per guest. Rate is based on 8 guests. More guests? Lower rate per guest! See our rate information for more details. 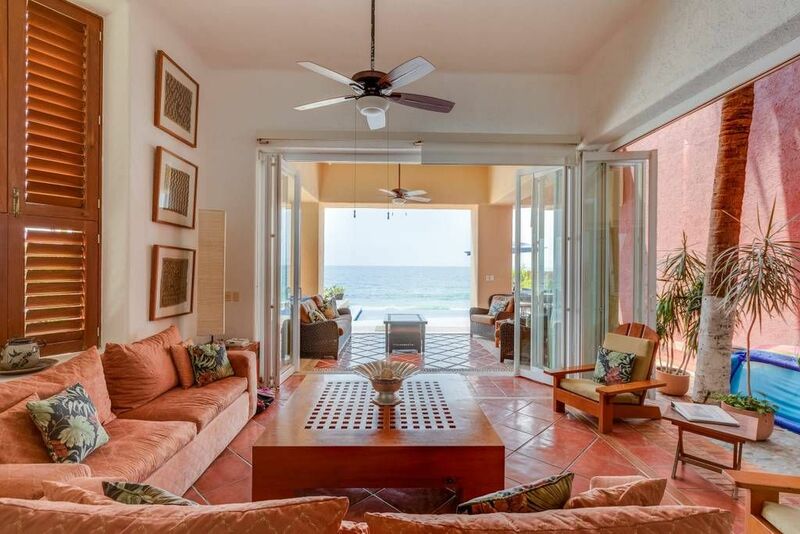 Villa Karaway (VK) is the ultimate Puerto Vallarta (PV) Beach Villa! A rare find on the powdery sands of Puerto Vallarta. The home is RIGHT on the beach. Please read the entire description, but first some ideas to save money and select the proper home. 1. Is the home right on the beach, or do you have to walk to the beach? 2. Is there SAND on the beach? Except for downtown and north of town, sandy beaches are rare. We have sand on our beach! 3. Are there any additional charges? VK rates are all inclusive, you just pay for the food and drinks that our chief prepares, along with tips. 4. Exactly where are you located in PV? You are 6 km south of town (about 12 minutes away), so you have the town amenities, without the hustle an bustle. We are right on the bus route (50 cents to town), or cabs are usually parked by the complex ($6 into town). You enter your two-story vacation home (named 'Villa Karaway') from a private iron gate into a masterfully constructed tiled hallway. To the right, past the sitting area, is the lower bedroom with two single beds, which can be make into a king bed (all bedrooms have air conditioning), a walk-in closet, and private bath. Close by is the washer and dryer. To the left of the hallway is the open-air patio with splendid plants. Up five tile-covered steps is another hallway. Turn left and you enter the gourmet kitchen (Viking stove, Sub-Zero refrigerator - but why care - you have your own chef! ), bar, walk-in pantry, table for four, and bathroom. Proceeding past the kitchen is the dining room with seating for eight. Past the dining room is the living room with floor-to-ceiling glass sliding walls to another outdoor patio with lighted palms, the downstairs porch, and the private infinity pool. Just past your pool is the wondrous Los Palmares Beach. Proceed the other way down the entrance-way hallway and you arrive at bedroom two. This is a bedroom with one queen and one king bed, a large walk-in closet, and an even larger bathroom. There is a large window that opens to the interior patio. Up the stairs further is bedroom three with two double beds, 12-foot high ceiling, a large window opening to the interior patio, TV and VCR, and private bath. Further down the hallway is the ultimate, master bedroom with a king-size bed. Floor-to-ceiling movable windows separate the bedroom to the upstairs patio. There is also a large window providing a view to the famous Los Arcos islands just off the shore of Puerto Vallarta. The master also contains a sitting area, large walk-in closet, and a bath that is also a jetted tub, steam, and a ten-side spigot shower. For those that are traditional, a normal showerhead is available. A telescope is provided to further enjoy the breathtaking views. These views include dolphins and whales playing in one of the largest bays on the continent. You will not be disappointed with Karaway or the Los Palmares facilities! Villa Karaway is part of the classy Los Palmares condominium complex. Everything is in tip top condition, including the large infinity pool, jacuzzi, kid's pool, and exercise room. There is also ample parking and 24-hour security. It is located just under six kilometers to the south of downtown Puerto Vallarta and is on the city bus route for easy transportation. We have wireless high speed internet connection. So bring your laptop or use the computer provided at the Villa. We also have a phone for free, unlimited phone calls back to the US and Canada. For Rental information and availability, please contact Hillary by phone or email. For more pictures and a floor plan, see the Villa Karaway web site listed below! Hello, our names are Greg and Hillary Shepperd and live in Denver Colorado. Like you, we work hard, and when we get away we want to spoiled and pampered. Villa Karaway is a great place to relax, unwind and enjoy - in style! We are happy to help you arrive and revive at Villa Karaway! Villa Karaway is our crown jewel in our properties holdings. It is a expertly staffed villa right on a sandy beach. When we walked through the completed construction in 1999, we absolutely fell in love with the building, the location, the facilities and the views - wow! Sit back and relax and let our gourmet chef (Elba) fix you wonderful local food and beverages. Our full time maid (Gloria) makes sure that your castle next to the sand and ocean is spotless. If you do wonder out of your palace, visit some fine restaurants, explore the rain forest, shop at the near by downtown area, surf, boat, fish, zip line, or relax in your own beach side infinity pool and watch the sun sink into the ocean. During winter you will also see plenty of sea life including whales - right from your porch! The Villa has a direct view of the beach and ocean. The Villa is located on the beach. We are right on a sandy beach. Part of the Los Palmares complex. Smoking on outside decks and property only. Beautiful property and accommodating staff. Our family of 10 enjoyed the villa, pool, and beach. This was our second time and we will return. Thanks! The Karaway Villa is excellent for families. Ten of us stayed for a week. Enrique made sure everything was in order. Elba and Gloria took excellent care of my family. Elba is an excellent chef and able to please even the pickiest of teenagers. She was open to prepare anything we asked. The pools are gorgeous and very quiet. The beach is somewhat short for beach walkers, but that simply leaves more time to lounge by one of two pools. It is easy to get into town and return even after mid-night. As soon as you walk into the lobby you realize your location and view is perfection! Each room in the house is large, private, and have very comfortable beds. The communal area was beautiful and spacious. The staff was incredible, attentive, and helpful with every step of our vacation. The master suite has a beautiful large upstairs balcony perfect for sipping morning coffee with your group. The beautiful sound of the ocean seeps in through the large glass doors as you sleep. I recommend staying up to view the reflection of the moon light on the ocean right outside by the pool or balcony. We did not do the all inclusive since we knew we would spend most of our time outside the house but we did get the fridge stocked with all our favorite goodies. We also had Elba prepare some of her amazing Ceviche, which was sooo delicious. They helped us order a last minute boat taxi, which picked us up right outside the house and took us to a private beach that you can only get to by boat. Then once we returned we walked south along the beach for about 5 minutes to a neighboring outdoor beach restaurant. Amazing prices with a beautiful sunset view right from your table. We also really enjoyed the breakfast at the restaurant attached to the house complex. The food, view, and price was also perfect!! This house is nothing less than perfection. We honestly can’t wait to return! Amazing location, amenities, and out-of-this world cooking. If you are looking for a peaceful spot, attentive service, and excellent food (especially fresh seafood) - this Villa can't be beat. The cook will never disappoint. Period. This is an awesome place to stay. Right on the beach, plus private pool and large pool. Beautiful setting, wonderful home. Perfect spot for a Puerto Vallarta get away. Property is clean and well appointed. We are definitely going back. Thank you! We are excited to have you back in 2019!! Everything about Villa Karaway is designed to allow you to relax and enjoy your time away. Elba, the cook, is superb and her meals are excellent. She takes individuals’ allergies into consideration when cooking for the group and prepares individual dishes as necessary. Gloria and the housekeeping staff make sure that your only job is to get up and enjoy the day. The ocean, pools and accommodations are inviting and everything is extremely well-maintained. You will want to plan your next visit while you are there because it is just that terrific. Don’t wait to make the reservation - Vila Karaway is really fantastic. Please ask us about organizing fun activities for your group like snorkeling, fishing, hiking, boating, whale watching, yoga, and more!